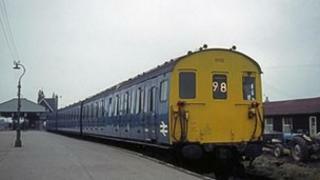 A Dorset train service is to be reinstated 41 years after being axed thanks to a £1.47m grant. A regular service on the 10-mile stretch between Swanage, Corfe Castle and Wareham is set to be restored by Spring 2015. Government funding will pay to upgrade track and bridges and two 1960s heritage diesel bus trains to mainline running standards. The project is set to create an estimated 50 jobs in the area. Peter Sills, chairman of Swanage Railway Company Ltd, rode on the last British Rail train from Swanage to Wareham in January 1972. He said: "We are elated at this tremendous and very historic news because the Swanage Railway has been campaigning to bring back regular trains from Swanage and Corfe Castle to Wareham since 1972 when British Rail controversially axed the service." He added: "It took British Rail just seven weeks to lift the seven miles of track between Furzebrook, Corfe Castle and Swanage but 30 long years for the Swanage Railway to relay it." Purbeck District and Dorset County councils have allocated £3.2m for a new track point at Worgret Junction. It was installed by Network Rail in December to enable passenger trains to use the route. A £500,000 level crossing across the Wytch Farm oil field and a park and ride access road near Corfe Castle are being funded by BP and Perenco. Nationwide, 20 seaside towns will benefit from a slice of £2.6m from the Coastal Communities Fund.